SOLAR ENERGY seems to have become a buzzword as more and more companies are venturing into the business of generating electricity from sunlight. They are drawn to the solar photovoltaic (PV) business because of the more-than-modest returns and guaranteed offtake for 21-year concessions. But even as competition heats up, the industry might hit a plateau in the near future as the Sustainable Energy Development Authority (Seda) has a limited quota of solar capacity to award under the Feed-in-Tariff (FiT) system. In fact, there is virtually no more solar capacity for developers to bid for this year, according to Seda’s website, following the award of 66mw for 2015. Nonetheless, companies like VSolar Group Bhd (fundamental: 0.6; valuation: 0) are preparing to go big into the solar business. VSolar has a massive rights issue in the pipeline that will raise up to RM115.3 million to fund the venture. In comparison, the group’s market capitalisation is only RM107.2 million. In fact, VSolar (formerly Fast Track Solution Holdings Bhd) aims to make solar generation its core business by adding roughly 10mw over the next three years, on top of its current 1mw. The company’s current core business is software and systems development. Notably, the loss-making entity was among the most actively traded counters last week, gaining 123% in the past two months to a high of 38 sen last Thursday. The rally was boosted last week by the announcement of a tie-up with Japan-based Eastasia Group Co Ltd, a solar engineering, procurement and construction (EPC) player, to undertake future projects. “VSolar doesn’t have to rely on bidding for new FiT capacity alone. It could acquire existing projects or take part in joint ventures. It isn’t easy to get funds from the banks for solar projects, and that is where VSolar can come in [to finance projects] once it has cash from the rights issue,” explains an industry executive. At the same time, the government plans to allocate about RM15 billion to introduce green technology initiatives as part of the 11th Malaysia Plan (2016 to 2020). It isn’t clear what the green technology initiatives refer to but director-general of the Economic Planning Unit Datuk Seri Dr Rahamat Bivi Yusoff says the plan provides RM3 billion to RM4 billion annually to create environmentally-sustainable developments. With solar PV making up the bulk of the country’s renewable energy under the FiT programme, industry players expect the 11th Malaysia Plan to have some allocations to continue the development of the business. That said, VSolar is still new to the game and there are many well-established players in the industry, including Cypark Resources Bhd (fundamental: 1.3; valuation: 1.8), which has accumulated over 34.6mw of capacity in the past few years to complement its renewable energy business. That capacity makes up roughly 18% of the country’s total planted up solar capacity of 191.34mw. However, Cypark’s share price hasn’t performed well, falling 35% over the past one year to RM1.92 last Thursday. At this level, Cypark is only trading at 9.49 times its historical earnings. Other companies that have diversified into the solar business but have not made it their mainstay include Amcorp Properties Bhd (fundamental: 2.4; valuation 2.1), which has a 10.25mw solar farm in Gemas, and EP Manufacturing Bhd (fundamental: 0.65; valuation: 3), which has 2mw capacity planted on the roof of its factory. Perhaps one company that can be compared with VSolar is ACE-market listed PUC Founder (MSC) Bhd (fundamental: 2.15; valuation: 1.1). The IT solutions provider that also markets fingerprint verification products recently bagged 1mw of solar capacity in the last round of bidding. With a market capitalisation of RM175.4 million, the company is roughly similar in size to VSolar and has announced plans to expand its solar capacity to 50mw in the near future. Just like VSolar, PUC Founder plans to raise more funds for solar expansion — either through a rights issue, private placement or even bank borrowings. The main difference between the two companies is that PUC Founder’s core business is profitable — it raked in RM9.8 million in net profit for the year ended Dec 31, 2014. At last Thursday’s closing price of 17 sen a share, PUC Founder is valued at 17.8 times earnings. In contrast, VSolar hasn’t had a profitable financial year in the past five years. For the year ended Dec 31, 2014, the group’s net losses widened to RM3.5 million from the loss of RM2.04 the year before. Looking ahead, it will be hard to see aggressive growth in the solar sector. This is because there is a finite quota of FiT projects that Seda can award, drawing from the 1.6% renewable energy levy on all electricity bills. The levy is being used to subsidise all FiT projects for the life of their concession. Hence, without a hike in the levy, the quota for new solar projects cannot grow. To make matters more challenging, Seda has put a freeze on the award of solar projects of more than 1mw. This is to spread the limited quota among more companies and individuals instead of concentrating the projects on a few. Previously, Seda had given out awards of up to 5mw. Furthermore, the FiT scheme could become increasingly redundant once independent power producers (IPPs) begin building commercial-scale solar farms at lower tariffs. 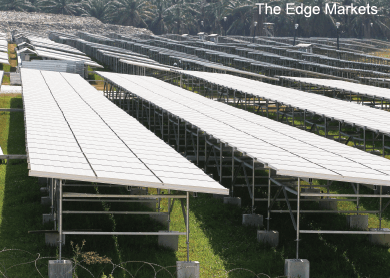 Edra Global Energy Bhd, a subsidiary of 1Malaysia Development Bhd, is in the midst of planting up a 50mw solar farm in Kedah, which will be the largest in the country. The group is also planning to do it at 50sen per kWh. In contrast, the lowest rate that the FiT programme is awarding at the moment is 69.77 sen per kWh. This doesn’t include bonuses that can boost the tariff to as high as RM1 per kWh. Furthermore, Edra’s 50mw plant is only a pilot project. The group’s power purchase agreement with Tenaga Nasional Bhd is for up to 500mw capacity. In contrast, the country only has 191.35mw of solar capacity installed at the moment. If the IPPs take over the planting up of solar capacity, Seda might choose to reallocate its funds towards other renewable projects like biomass, biogas and mini hydroelectric. Companies like Cypark Resources may have reaped the benefits of the early FiT rates, which are said to have given handsome double-digit returns. However, it looks like the music for the solar FiT party might be stopping soon as the big boys muscle in on the game. Players like VSolar and PUC Founder have to move quickly to secure new capacity if they hope to make solar generation their mainstay.